Presbyopia is a visual impairment that comes with aging in which the ability to focus on close objects becomes significantly reduced. With the increasing worldwide population of older adults, a significant number of individuals are developing the condition, which currently cannot be avoided. The lenses of your eye curve to focus on objects at varying distances. Some theories are that as you grow older, that curvature is reduced because the natural lenses lose their give. This condition is known as presbyopia and is defined by difficulty focusing on things right before your eyes. This often can start to take place any time after the age of forty. Sufferers usually cope with the reduced vision by holding the paper away from their eyes or standing at a distance from the object they want to focus on. Shifting from focusing on far off things to nearer ones is often strenuous for people with presbyopia. This stress can add to one's discomfort by causing eye strain, fatigues or headaches. Most commonly bifocal lenses or progressives (PALs) are used to resolve this problem. A bifocal lens has two points of focus, the main part of the lens has a prescription for seeing objects from far away and the other part of the lens is for seeing objects that are close by. Progressive addition lenses work similarly to bifocals, but the transitions between the two prescriptions are more gradual and have no clear line between them. Users will more easily adjust their focus, as they could if they had uninhibited vision. Another option is reading glasses which, unlike bifocals or PALs which are worn all day, are used only when needed. If contact lenses are preferable, you might want to consider multifocal lenses. People adjust differently to multifocal lenses, so it may take a few tries to figure out if and in what combination they work for you. 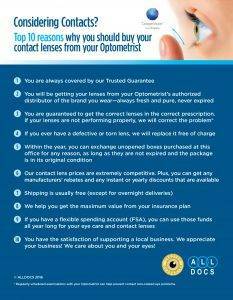 There are also surgical options that could be considered that may be worth discussing with your optometrist. Many people find the most success by using a combination of options for presbyopia. Furthermore, because your eyesight will likely worsen with age, you will probably need to keep adapting your correction. The positive news is, there is a significant amount of experimental treatment on the market currently to discover more and perhaps more permanent treatments for presbyopia.